In October 2012, news stories announced that the Police Service of Northern Ireland would be pursuing subpoenas of tapes and notes from interviews with former IRA member Dolours Price. The PSNI had already gone after Dolours Price interviews archived at Boston College, but this new effort was to be directed at the newspaper and TV journalists who had interviewed Price about the BC subpoenas. In the crosshairs: CBS News and the Sunday Telegraph. More than a year and a half later, there is no evidence that those subpoenas ever arrived. When Sinn Fein leader Gerry Adams emerged from his four-day interrogation at the PSNI's Antrim station, he said that police had confronted him with material from the Boston College interviews; he made no mention of CBS or Telegraph materials. And my own tedious search of Pacer, the federal court case management website, turns up no evidence of subpoenas served on CBS News headquarters in New York. To be sure, we can't see very far into the underlying events, and it's not clear what kind of contest may have taken place over this threat of subpoenas directed against journalists. I've been asking journalists and public affairs staff at CBS News and the Telegraph if they received subpoenas, or discussed the possibility of subpoenas with the PSNI, but those questions have gone entirely unanswered. Liz Young, the public affairs director at the PSNI, offered this careful non-answer to my questions: "Given that investigations are ongoing we are not in the position to either deny or confirm that a subpoena was sought and no inference should be taken from this." So the conclusion has to balance the likely with the wholly unknown: It appears that the PSNI threatened journalists with subpoenas, but then didn't follow through, and it's not possible at this point to know why the threatened subpoenas apparently didn't arrive. Now: Spot the pattern. In May of this year, a new round of news stories announced that the PSNI would be seeking new subpoenas to secure every Belfast Project interview archived at Boston College. Again, no one is answering questions, but there's no sign that those subpoenas have arrived. Meanwhile, the high-profile arrest of Gerry Adams resulted in nothing more than the four-day-long collapse of the PSNI's souffle. Three years after the Grand Inquisition began, Adams is a free man, and would not seem to have much reason to worry. The other big event in the PSNI's supposed murder investigation was the March arrest of former IRA leader Ivor Bell, long purported to have been chief of staff to Adams in the 1970s IRA in Belfast. Bell was charged with aiding and abetting McConville's murder, not with committing it; as yet, the PSNI hasn't charged a single person with actually kidnapping McConville or actually killing her. And Bell is also a free man, released on bail as the Public Prosecution Service tries to decide whether or not to bother taking the charges to trial. They do not seem to be in any particular hurry. So the PSNI's "investigation" into the 1972 murder of Jean McConville -- an investigation opened 39 years after the event -- has made more noise than progress: some arrests that led to the release of those arrested; an arrest, with weak and likely to be abandoned charges, of someone who isn't alleged to have killed McConville; and a storm of threats and promises that have mostly seemed to evaporate. The available evidence continues to support the argument that I've now been making for more than three years: The PSNI is putting on a show, not a murder investigation. But then spot the other pattern: Many news stories reported the PSNI's claim that it would subpoena CBS News and the Telegraph; none reported that the subpoenas didn't arrive. Many news stories reported that the PSNI would be pursuing the whole Belfast Project archive at Boston College; no news stories have reported that those new subpoenas haven't been served. Many news stories reported the dramatic arrests of Adams and Bell; few journalists appear to have noticed that the air has leaked out of those arrests. 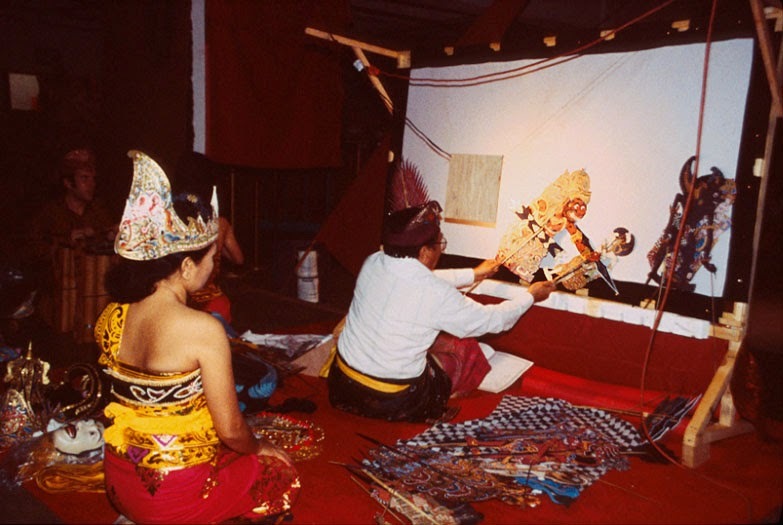 In Indonesia, puppeteers perform Wayang Kulit, a theater of shadows in which images are projected on a screen by performers who stand behind it. The PSNI is the Dalang, the puppeteer, in the shadow play of the Jean McConville "investigation." And the news media continues to treat the play as real life.